Marjorie Dietz, from Alberta, Canada, is about to embark on the ultimate experience to the top of Africa. 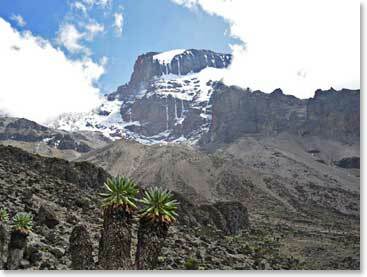 On July 6, Marjorie will be driven to Lemosho Glades at 6,890 ft, for the start of her ascent. Before her planned summit, she will spend the night camping in Kilimanjaro’s crater, elevation 18,700 feet. Stay tuned as she reports her daily experiences as she traverses this wild and unspoiled route. Marjorie’s adventure will not end after her climb. She will then make her way through some of Tanzania’s traditional villages to meet the ‘click’ people and extend her culture experience in a Masai camp. July 21, 2009 – Farewell and Asante! July 19, 2009 – Giraffes, Ostrich, Flamingos - Oh My!